Apple fans have another book to add to their reading lists, this time focusing on the business side of things. 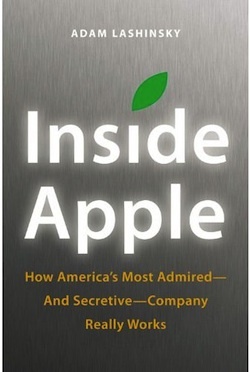 Titled Inside Apple: How America’s Most Admired – and Secretive – Company Really Works , the reader gets an in depth look at Apple’s unique culture and internal processes, ranging from it’s legendary secrecy to how it creates and markets everyones favorite products. If Apple is Silicon Valley’s answer to Willy Wonka’s Chocolate Factory, then author Adam Lashinsky provides readers with a golden ticket to step inside. In this primer on leadership and innovation, the author will introduce readers to concepts like the “DRI” (Apple’s practice of assigning a Directly Responsible Individual to every task) and the Top 100 (an annual ritual in which 100 up-and-coming executives are tapped a la Skull & Bones for a secret retreat with company founder Steve Jobs). Based on numerous interviews, the book offers exclusive new information about how Apple innovates, deals with its suppliers and is handling the transition into the Post Jobs Era. Lashinsky, a Senior Editor at Large for Fortune, knows the subject cold: In a 2008 cover story for the magazine entitled The Genius Behind Steve: Could Operations Whiz Tim Cook Run The Company Someday he predicted that Tim Cook, then an unknown, would eventually succeed Steve Jobs as CEO. While Inside Apple is ostensibly a deep dive into one, unique company (and its ecosystem of suppliers, investors, employees and competitors), the lessons about Jobs, leadership, product design and marketing are universal. They should appeal to anyone hoping to bring some of that Apple magic to their own company, career, or creative endeavor. If you were a fan of the official Steve Jobs biography, you’ll probably enjoy this book too. You can get Inside Apple on Amazon.com for $16 , Kindle and iBooks versions are also available. Not sure if I need to read this one, it’s 240 pages and it seems like every Apple “news” site is slowly cut and pasting the entire book anyway! Looks good, I’ll read it.